James Hinchcliffe opened the 2013 IZOD IndyCar Series season with a victory at the Honda Grand Prix of St Petersburg. The victory was the first of his career and it came in his 32nd start. “I don’t think you can get much better than winning the first one because as soon as I crossed the line I burst into tears, and I never thought that was going to happen when I won my first race,” the Andretti Autosport driver said. One of the Team Penske cars which Hinchcliffe mentioned belonged to Helio Castroneves, who finished second. Finishing third was Hinchcliffe’s teammate, Marco Andretti. The 26-year-old Hinchcliffe overtook Castroneves in Turn 1 of a Lap 85 restart, conserved fuel in the No. 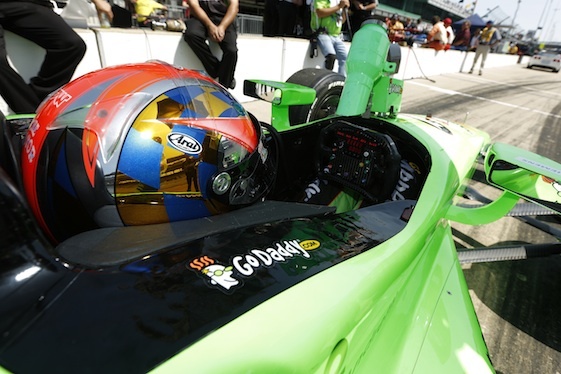 27 GoDaddy.com Chevrolet for Andretti Autosport and held on for a 1.0982-second victory. He’s the first Canadian to win an Indy car race since Paul Tracy in 2007 at Cleveland and gave Michael Andretti his 44th Indy car victory (two more than he had as a driver). Andretti overtook Simona de Silvestro in Turn 1 of the final lap to earn third place (his best road/street course finish since Toronto in 2011). Will Power, who earned his 30th Indy car pole, led 26 laps before Castroneves made an inside move on a restart and it went downhill from there. Under caution, the No. 4 National Guard Panther Racing car driven by JR Hildebrand sprung over the right side of Power’s No. 12 Verizon Team Penske car, causing a flat rear tire and bent mirror. The team spent two pit stops to repair and check for damage. Then, while running 12th, the rear end of Power’s car caught the Turn 4 tire barrier. He finished 16th. Ryan Hunter-Reay, who started and finished third at St. Pete last March on his journey to the series title, encountered issues on an early pit stop and was not in contention.